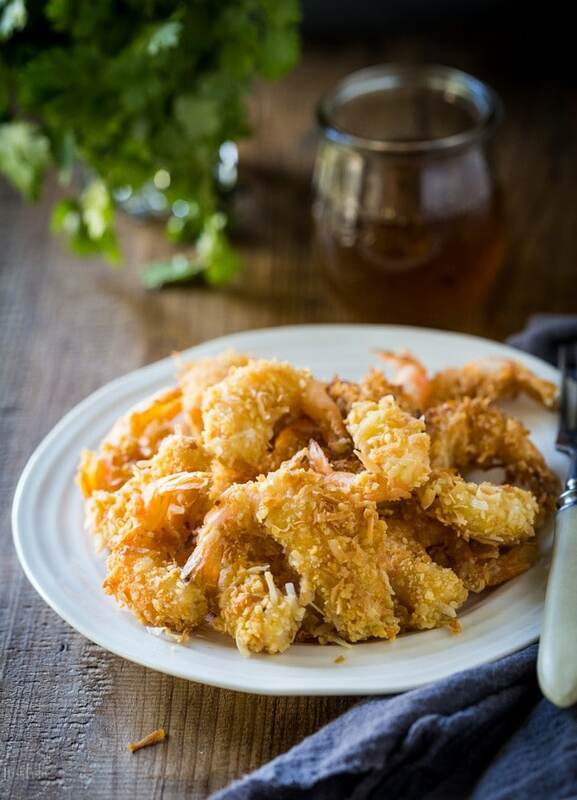 Home » By Diet » Dairy Free » Truly Crispy Coconut Shrimp! This is the BEST Crispy Coconut Shrimp, It’s so much better than Outback! 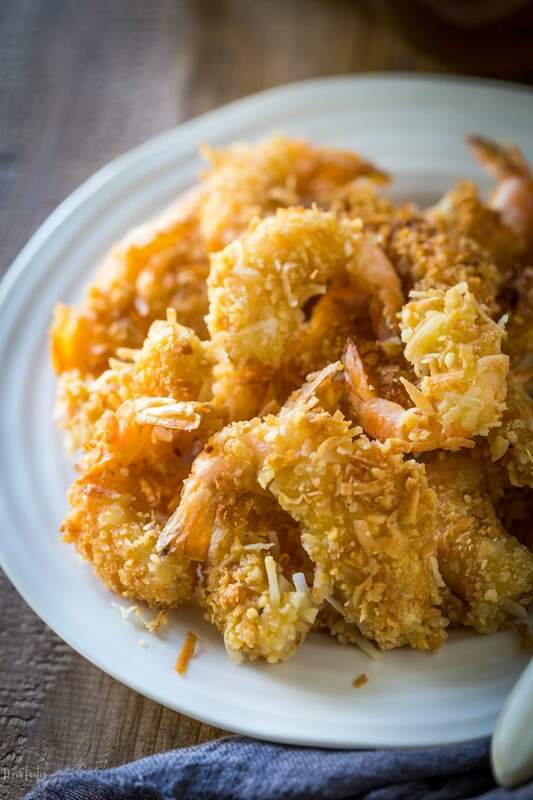 If you want to learn how to make coconut shrimp then look no further! I once asked my collective Facebook friends for gluten free party food ideas but I forgot to let them know I can’t tolerate dairy. They were very obliging of course but all the recipes they shared were made with cheese, every single one! Not that I host a lot of parties you understand, I lead a very boring life that consists mostly of not eating cheese and making excuses for why I’ve not done the ironing for three years. But if I was slightly less boring and did decide to host a party then I would absolutely want to eat something that would outrank the pecan crusted cheeseball, enter the Crispy Coconut Shrimp! I can’t claim title to this wonderful recipe though, it’s one of many delectable creations by my friend Nicole Hunn from her latest book Gluten-Free Small Bites. I’ve had a chance to look through the book and there are 100 recipes that would be perfect for parties, packed lunches and potlucks, I think you’ll love it! So listen, unless you are living on or near the coast you probably won’t have access to fresh seafood and you’ll need to know what to look for in the grocery store. Generally speaking I totally avoid farmed shrimp from Asia as the quality is often questionable, what I really want is shrimp caught in US waters. Another thing I steer clear of is shrimp that is frozen with preservatives such as sodium tripolyphosphate, I think it adds a nasty taste to the shrimp so where possible I look for shrimp that is simply frozen in ice. If you want to know a little more about choosing safe and sustainable seafood then you’ll find a wealth of information on Seafood Watch. For this recipe you don’t really need a deep fat frier, a heavy bottomed pan such as a cast iron skillet will do the trick nicely. I’m a tad obsessed with cast iron pans and have several including a large skillet and another one that is about 8 inches across. I used my 8 inch cast iron skillet simply because I didn’t have enough oil to fill the bigger skillet, the only slight downside with that is that I could only fry the shrimp in smaller batches. You want to keep the oil at a medium to high heat, and it should be hot enough that crumbs dropped in it will start to sizzle right away. 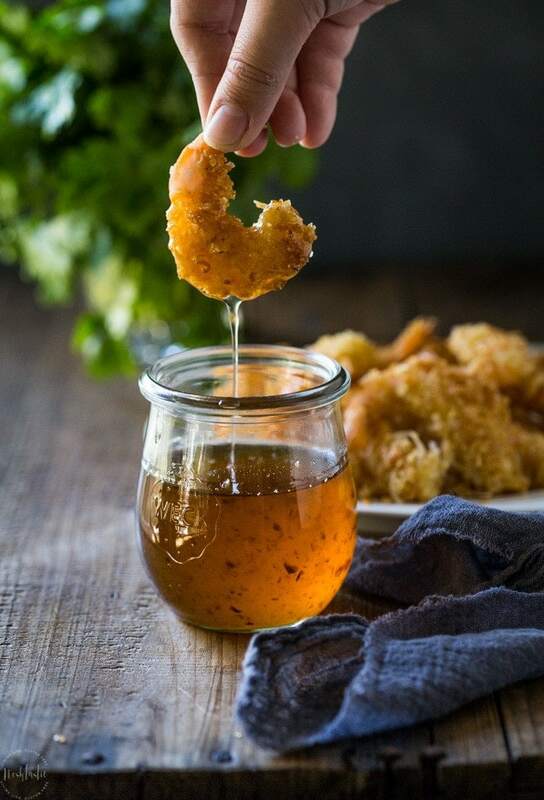 It only takes about two minutes or less per side to get the shrimp looking nice and toasty, use metal tongs to turn them and be sure to grab them by the tail so you don’t knock off all that yummy crispy coconut coating. So I do have just a couple of appetizer recipes I want to share with you! First up is my Bacon and Cheese Stuffed Mushrooms, they are VERY yummy and you can make them with the dairy free soft cheese if you need to. One of my most popular posts is a very simple recipe for Sausage and Pineapple Party Bites, they are so easy to make and go over very well any time I’ve served them. And lastly, no party would be complete without some home made Easy Guacamole, you just have to have it! Line a large rimmed baking sheet with unbleached parchment paper and place the coconut chips on it in single layer. Place the baking sheet in the center of the oven for five minutes, remove from the oven and stir them around and bake for five more minutes until they are a light golden color then take them out to cool. crush the cooled coconut chips into small pieces and mix with the panko. Set up a dipping station with three shallow bowls, one with the flour, salt and pepper, one with the eggs and one with the coconut and panko mix. holding the shrimp by the tail, dip it in the flour first, shake of any excess, then into the egg and then fully coat with the coconut and breadcrumbs. place paper towels on a large plate and set aside. Add about 1/2 inch of oil suitable for frying to a large heavy bottomed pan such as a cast iron skillet and heat until rippling. Fry the shrimp in small batches, about 2-3 minutes per side, do not crowd the pan! remove from the pan using tongs and place on the plate with the paper towels. Let them cool for a minute or two, and then serve warm. From the book Gluten-Free Small Bites: Sweet and Savory Handheld Treats for On-the-Go Lifestyles and Entertaining, by Nicole Hunn. Excerpted by arrangement with Da Capo Press, an imprint of Perseus Books, LLC, a subsidiary of Hachette Book Group, Inc. Copyright © 2016. I have never craved shrimps like l have in this pregnancy. I do have to cook them myself to make sure they are cooked through, and this is one lovely recipe. The addition of coconut is just fabulous, it must bring such a great taste. Oh, have l mentioned how amazing your food photos are? They all make me drool. This shrimp looks phenomenal – I’m LOVING Small Bites, it’s my new favorite cookbook! What did you use for dipping, is that sweet chili garlic sauce? Hi Sharon! I used Captain Rodney’s sauce which is similar to sweet chili sauce.